You can Normal Summon/Set this card without Tributing, but its original ATK/DEF becomes halved. Once per turn, if this Normal Summoned/Set card is on the field (Quick Effect): You can destroy this face-up card, and if you do, destroy all monsters in the Main Monster Zones with ATK less than or equal to the ATK this card had on the field. Segmental Dragon hearkens back to the days of old where you could get high level monster on the field by cutting its ATK/DEF in half. 1300ATK/1200DEF is what you are left with if you cut this cards stats in half to summon without a tribute. Despite that, you have a level 7 on the field then. Segmental can wipe the board of face-ups that have lower or equal ATK as it does right now. The monsters have to be in the Main Monster Zones, so no Extra Monster Zone (downside), but there are certain combos you could run to get this cards ATK back up to get a better board wipe. Despite that, there are still some monsters that are under 1300ATK that can get destroyed by Segmental. The effect is only if the monster is Normal Summoned/Set, a great balance effect, as dropping it in the grave, reviving it, then wiping the board is far too easy. You can use the effect during your opponents turn, as it is a Quick Effect, a plus instead of it being like Tribe-Infecting Virus. You could still Normal Summon it under Skill Drain, pop Skill Drain with a card and then wipe the field. Segmental Dragon is a Level 7 Light Cyberse-type monster with 2600 and 2400 Def. 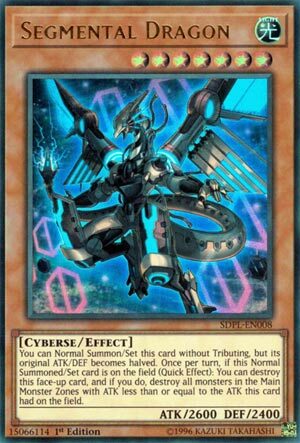 The stats for a 2 Tribute monster are ok, but even in a Cyberse deck, there will probably be a better 2 tribute monster. And you want to use 2 tributes on this because that’s the only way to gain it’s quick effect. If Normal Summoned or Set Segmental Dragon can destroy itself to destroy monsters on the field that have less Atk than it had on the field. Destroying Main Monster Zone monsters with 2600 Atk or less during either player’s turn is good. You can stop an entire Soul Charge or Scapegoat play very easily this way. If you so desire you can Normal Summon or Set this without Tributing by bringing it’s Atk down by half. 1300 Atk just isn’t as imposing a field wipe though. There are ways to bring the Atk back up, but then you could just run Torrential Tribute and make Segmental Dragon completely unnecessary. Every archetype/type has something that feels sort of out of place and Cyberse is no exception with Segmental Dragon. Segmental Dragon is a Level 7 LIGHT Cyberse with 2600 ATK and 2400 DEF. Stats are good for a Level 7, LIGHT is a good attribute and Cyberse will get support for the next few years. Segmental Dragon lets you Normal Summon or Set this card without tributes, but its original ATK and DEF becomes halved. This reminds me of so many big monsters in the past that you Normal Summoned without tribute but weaken its ATK, but they were really good with Skill Drain. Once per turn, if Normal Summoned or Set card is on the field (Quick Effect), you can destroy this face-up card and then destroy all monsters in the Main Monster Zones with ATK less than or equal to the ATK this had on the field. If you Normal Summon/Set without tributing then this will have 1300 ATK, so it’ll probably be the weakest monster you control so you don’t destroy anything. This thing can easily destroy your opponent’s weak monsters they plan to Link away with like Tokens. If you tribute two for this, then you got a lot of room to destroy a lot of stuff. Segmental Dragon is nice on paper, but there are better ways to stop Link plays, some of which are still staple cards in many different decks. You can probably do without Segmental Dragon. Art: 4/5 Well that looks cool, sadly the art doesn’t match the effect. Look, it’s Fusilier Dragon again! Just not as good. Segmental Dragon (who is Level 7, with 2600 attack and 2400 defense)…let’s see, Level 7 means no Trade In, 2600 is good for Level 7 though, Cyberese is obviously appropriate, and Light is a definite benefit for sure. As referenced, the first effect lets you Normal Summon/Set without Tributing at the cost of half the attack and defense. I like what this card is trying to do, you only get the effect of this card if you Normal Summon or Set it. A Special Summon only gets you a 2600 Cyberese Monster, and you need more than that. But as I referenced, I like the idea you have to play by the rules (so to speak) to get the payoff from this card. If said card was Normal Summoned or Set, once a turn (as a Quick effect) you can destroy this face-up card. Doing so lets you destroy ALL Monsters on the Field in the Main Monster zones, so long as their attack is less than or equal to the attack of Segmental Dragon. That’s where the initial effect is going to hurt you. 1300 attack or less would be destroyed, and you have to destroy two Monsters just to get a +1 off this advantage wise. (You’d have to destroy FOUR Monsters to get a +1) if you Tributed for this card (three Monsters lost, your Tributes, and this card). While if you had, you’re likely destroying a lot of cards, as 2600 attack obviously opens that up a lot more than 1300 attack does. Nice idea, but the execution here is moderately flawed. It’s just not worth the two Tributes, unfortunately. It could be a card to have some fun with though.